Coffs Harbour is a coastal city in northern New South Wales, Australia. Sydney is 540 km south of Coffs Harbour and Brisbane is 440 km north of Coffs Harbour. Coffs Harbour is a well known surfing spot. Coffs Harbour city can be broken up into these precincts: Boambee, Coffs Harbour City Centre, Coffs Harbour Jetty, Diggers Beach, Korora, Moonee Beach, Park Beach, Red Hill, South Coffs, West Coffs, West Korora, Sapphire Beach. Coffs Harbour is famous for its bananas and is home to the Big Banana tourist attraction. The Coffs Harbour Jetty is an historically important timber wharf. Coffs Harbour Regional Airport is the local airport and is regularly serviced by Qantas, Virgin Blue and Brindabella Airlines. Sites of interest in the Coffs Harbour area include: Solitary Islands Marine Park, Muttonbird Island, Coffs Harbour Education Campus, Big Banana, Coffs Harbour Jetty, Bellingen, Coramba, Nana Glen, Corindi / Red Rock, Dorrigo, Sawtell, Woolgoolga. Port Macquarie is a large town on the mid-north coast of New South Wales, Australia. Port Macquarie is 390 km north of Sydney and 570 km south of Brisbane. 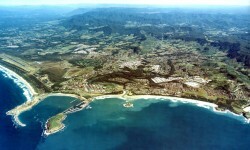 Port Macquarie is located at the mouth of the Hastings River. 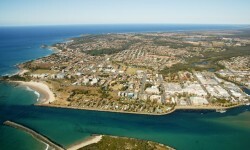 Port Macquarie is a popular retirement location and popular tourist destination. Port Macquarie is a water lovers paradise. Enjoy the coastal walks, surfing, sail boarding, swimming, fishing, whale watching and even camel rides whilst in Port Macquarie. Port Macquarie is linked by daily air services to both Sydney and Brisbane. Port Macquarie Airport has regular flights to Sydney with QantasLink and Virgin Blue, and to Lord Howe Island with QantasLink. Popular beaches in Port Macquarie include: North Shore, Town Beach, Oxley Beach, Rocky Beach, Flynns Beach, Nobbys Beach, Shelly Beach, Miners Beach, Lighthouse Beach.